If your kids pine for a room of their own then our four bedroom villas could suit your family well. 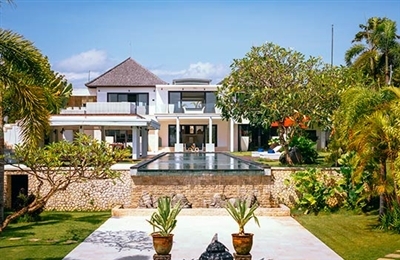 Four bedroom villas will also appeal to groups of friends and handfuls of couples looking for more facilities and that little bit of extra space. They'll often come with one twin bedded room, giving even more flexibility. Anandita is exactly what a ‘destination villa’ should be. It was lovely to be surrounded by calm seas, very comfortable lodgings and a team of staff who really know what they are doing. Everything is laid on and we really had no desire go out, feeling so relaxed and content that all we did was swim, eat and sleep in the sun, with a little bit of volleyball and billiards thrown in for good measure. The beach is ultra safe making it a great place for children to paddle and play; we felt that families would love this place given the choice of activities, and the room layout and bed configuration. That said, the rooms would work equally well for four couples. Something that really impressed us was the way the staff stopped what they were doing when we invited them to make up the numbers for a game of volleyball. 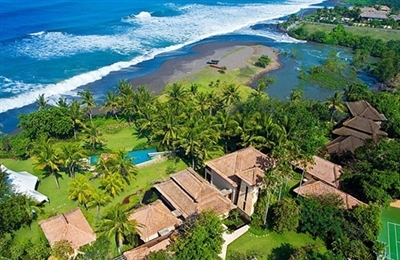 It is rare to find a villa where the owner has encouraged his staff to go the extra mile to please guests in this way. To quote from the visitors’ book, “The staff are truly the heart of Anandita”. The kitchen produces some fine meals, with the emphasis on fresh fish and local produce - but remember that (if you wish to order from the suggestion menu) you need to give a bit of notice when ordering your meals or making your grocery list as the villa is a long way from the nearest shops. An easy alternative is to opt for the all inclusive meal package offered at the villa which includes breakfast, lunch, dinner and afternoon tea. 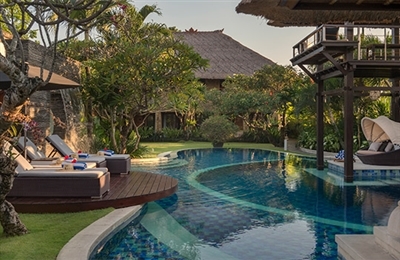 Nothing changes very much in Lombok, so when we returned to Villa Anandita for our three-year-update we were delighted to find that everything was very much as it had been, including most of the staff who remembered us from our first visit. Gusti the manager/activities manager delighted us with his energy and enthusiasm, taking us out for a long bicycle ride across the golf course and along rough tracks through the fields to the traditional market at Tanjung. Since our last visit, the complement of bicycles has gone up to 13 and the owners have added a spa pavilion with two massage beds (professional therapists will come to the villa to deliver soothing treatments). We were also pleased to find that the villa now has a WiFi internet connection, so it doesn’t feel quite so detached from the world. The property has been well maintained but the beach bordering the garden has suffered from a bit of erosion so it has got narrower, but it is still beautiful to look at and you only have to walk a short distance to reach a wider section of sand. Oh yes, there’s a new international airport in Lombok now, which is further away from the villa, so the journey is longer but you’ll see some gorgeous rural countryside en route. Villa Anucara’s stark, modernist design may not suit everyone — stripped of its Indonesian artefacts, it could be at home in Miami, Monaco or any number of expensive beachside playgrounds. But this reviewer swooned over the purity of the design, pleasing symmetry, and sense of space and light. The white and ivory colours splashed with aqua create a restful and restorative palette to counter the rectilinear strictness of the architecture. We liked the counterbalance of avant garde with antique, the textural play with Palimanan stone, teakwood planks, polished concrete, fossilized wood, gnarled tree roots and granite. And we loved the artistic flourishes and deliciously thought out details. Unusually, those who don’t draw straws for the master suites will not feel short-changed. (Magnificent though our master suite was, we would have been delighted to stay in guestroom 3 with its shaded grove of palms and its stunning outdoor bathroom with monsoon shower arch and lava-stone wall of water cascading down to a sunken hamam-style bath.) In this respect the villa is highly suited to groups of friends and families — who will also appreciate the many private spaces that allow for quiet as well as social holiday time. We would perhaps be nervous of bringing very young children here because of the stretches of unfenced water, unguarded stairs and upper deck, but note that baby cots and high chairs can be provided; indeed the party before us included several toddlers — and they stayed for a month! For those who love the ocean (like us), there are few experiences that can match staying right on the beach – especially in a spacious and luxurious tropical villa – so Villa Arika definitely ticked all our boxes. The views are quintessential Bali; everything we expected and more – especially from the master bedroom, which has a lovely private deck. With the huge lawns, the rugged coastline in both directions, and the ocean stretching to the horizon, there is a fabulous feeling of space and openness. Landscaping is thoughtful, with rounded garden beds that mimic the curves of the shore and are filled with low shrubs that complement, rather than distract from the ocean views. We quickly adapted to the rhythms of nature – lounging by the pool, exploring rock pools on the beach exposed at low tide, languishing in the flamboyant sunsets. Evenings had their own gentle allure with the soft glow of candles and hurricane lanterns. Dinners at the wonderful marble dining table were particularly memorable, surrounded by magically lit lily ponds. Pererenan is delightfully sleepy and serene, and most of the time we were really happy just to chill at the villa and relax, but it was great to have a driver on hand when we managed to tear ourselves away. It is difficult to pinpoint what’s best about The Arsana Estate. During our stay the chef cooked an exquisite dinner which was served fabulously by the staff. With the windows open, the sound of the waterfall and distant wildlife and a gentle breeze drifting in it was a delight. 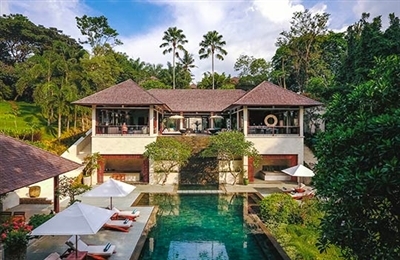 The so-cool pool leads off into the jungle, and with the Boss sound system cranked up, a G&T in hand and a masseuse on call, what more could one ask? The staff were a pleasure – especially the villa manager – always attentive and smiling but nicely discreet. We could hardly believe it when the manager chased us on his motorbike for seven kilometres to return our laptop cable after we checked out. Such care! The bedrooms have superb views, ‘top’ bathrooms and ever-so-comfortable beds: closing the blackout curtains led to a deeply enjoyable but totally unplanned lie in! Game of billards? DVD on the big screen? Walk in the village? There’s so much to do and yet it’s so easy to chill. To be honest there was no one thing that makes this villa shine, it all works really well and we could not recommend it enough. 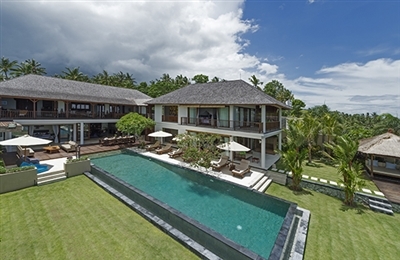 Returning to Villa Asada after three years we were really pleased by the way in which it has evolved to become a truly magnificent family holiday villa with stunning views over the spectacular Amuk Bay. Since our original visit, the property has changed hands and undergone an extensive upgrade, with an enormous amount of thought put into the provision of guest needs in the form of deep comfort and some great new facilities (including a poolside bar, and a gym). The Asian food we had was excellent (best satay sauce ever!) – do note though that the villa is a good hour away from major provisioning so whilst local food can be provided at relatively short notice, more complex meals need a little more planning. As such there is a restaurant style house menu and an advanced order menu where 24 hours notice is requested. The chef (included) will help out with all your meal planning though. 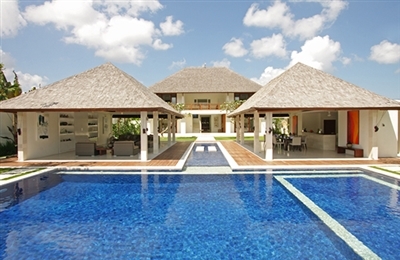 Architecturally simple yet eminently comfortable, Villa Asante makes a great holiday pad for a couple of families. The layout is very practical, especially the open sided common areas which flow so well to the pool. It is commendable that the owners have resisted the temptation to build a mega-villa on what is quite a big plot – resulting in much more open space to relax and for kids to run around in. The pool is superb, with shallow sections for toddlers and practical decking which is not slippery even with wet feet (unlike the terrazzo floors). It could do with a little more shade although there are sun umbrellas and a very pleasant balé. Bedrooms are practical and comfortable too, and the bathrooms really are very good, especially the downstairs ones with outside showers and walled gardens. On a recent re-visit we found the (now much more experienced) staff to be superb and the food conjured up by the chef to be tasty, if a little pricey. 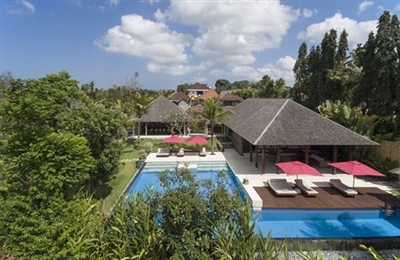 Of all the villas we’ve reviewed in Bali, Villa Asta is tops for families and kids. Never have we seen a villa so well set up for children’s entertainment, and with separate zones so that the adults (and kids) can escape from one another. It is no surprise that it's often booked for months in advance and guests return each year. The Guy Morgan-designed villa is full of common sense but without skimping on the luxury. In the three-bedroom pavilion, many guests will appreciate the flexibility of the bed configurations. Do note that whilst we rave about Villa Asta for families – these bedrooms are excellent for adults too, so the villa would work well for groups. The private plunge pools beside the master bedrooms’ pavilion are a gorgeous plus. Overall we found the villa to be a very bubbly and happy place, from the excellent staff who served us a wonderful barbecue during our inspection, down to the super friendly (and very fat!) koi fish, which are a great source of entertainment and fun to feed. What is also special about Villa Asta is the lovely stonework and thatch, which left us in no doubt that we were in Bali. When we revisited the property recently, we found that it has been immaculately maintained, with some new upholstered furnishings, a new marble floor, and upgraded facilities such as flat-screen TVs, computer and printer for guest use, and the addition of four bicycles. In spite of the ‘high-design’ tendencies that characterise the simplicity and style of Astika Toyaning, we didn’t feel that it’s a look-but-don’t-touch kind of place. To the contrary, it’s very much the kind of space that finds you taking a deep breath and feeling like you’ve landed in the lap of peace and relaxation. The dining area, with its gorgeous wooden feasting table, just begs for long lunches followed by satiated snoozes followed by long dinners followed by satiated snoozes… you get the picture. In fact, the use of wood throughout the villa adds beauty to the simplest of spaces and objects (who knew a bathroom basin could be such an object of lust and envy?) while the effective and dramatic use of red adds a certain modern glamour to the décor. Astika Toyaning’s 1600 square metres of space, give all guests plenty of breathing room, and when you add to this the proximity of water – the river, the pool, the water feature – you’ve got a villa tailor-made for the ultimate in relaxing holidays. There’s something very special about Bali-living when you know that beyond the garden walls are only acres of rice fields and greener than green countryside. 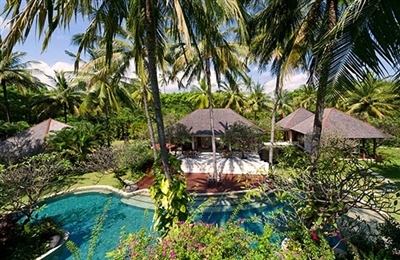 Villa Atacaya rests in a patch of south-west Bali that is (so far) only sporadically dotted with villas and villages, so we knew we were in for the privileged private country life when we arrived. We were not let down. This is a big, modern villa with plenty of space and contemporary design (predominantly in white with colour-themed bedrooms) that is absorbed immediately by the artwork of nature found in the forest and river that borders its eastern flank. Instant peace and serenity… if you like the constant hum of cicadas and birds, that is. We do. There’s a cooling breeze coming off the river and the pool is always at the perfect temperature for a dip. The local area is very rural and it’s worth taking the time to go out for a stroll through the rice fields, coconut groves and villages to fully absorb your surroundings. We walked down to the beach (3km) at sunset and sat on a bluff above the black sands and crashing waves with a coke and a coffee bought from one if the local warungs. Highly recommended! The service of a car and driver is a thoughtful provision in this remote location should you wish to go further afield. Please note that this villa is not suitable for toddlers due to the water gardens.